The number of people sleeping rough on the streets of London has risen by over one-third in the past year, new government figures reveal. The crisis has prompted homelessness charities to call for sweeping reforms. A report published by the Department for Communities and Local Government found that levels of homelessness in the capital rose by 37 percent between 2013 and 2014. The rest of the country also saw rises, averaging at 14 percent. The figures are an embarrassing failure for London Mayor Boris Johnson, who has always publicly claimed to put homelessness at the top of his agenda. He previously pledged to eradicate the problem by as long ago as 2012. The report said that there were nearly 750 people sleeping rough on the streets of London, which accounts for 27 percent of the total national figure. Some 46 percent of the capital’s homeless were UK nationals, while others were Polish, Romanian, Irish, Portuguese, African and Asian nationals. Ministers have said that despite the implementation of a homelessness prevention scheme, the figures are a cause for concern. The report's findings have prompted homeless charities to call for legal reforms. Crisis, a British charity that works to house the homeless, called for a law to force councils to provide help for people who are not prioritized on local authorities’ housing lists. Jon Sparkes, the charity’s chief executive, said the research showed the extent to which the law is "failing people facing homelessness." “Welfare reform, benefit cuts and a chronic shortage of affordable homes mean more and more people are coming to their council as homeless. But as the law stands, far too often when single people ask for help, they are turned away to sleep on the street,” he added. Mayor Johnson has raised awareness about the levels of homelessness in the capital, and has taken part in publicity stunts such as spending a night on the streets with Evgeny Lebedev, the Russian multi-millionaire owner of the London Evening Standard and Independent newspapers. 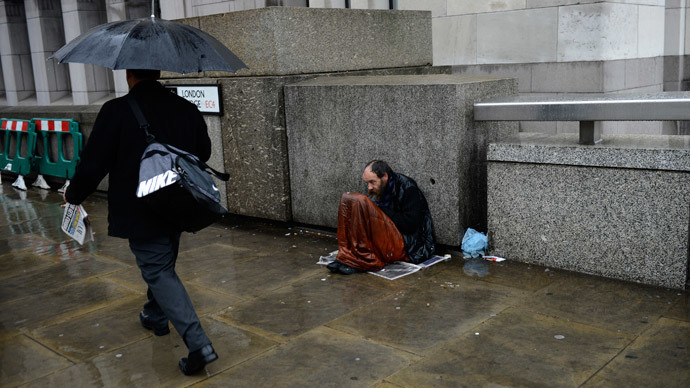 Kris Hopkins, Britain's minister for the homeless, said that the government’s “No Second Night Out” scheme had given more rough sleepers the opportunity to get help. He claimed that around 75 percent of new rough sleepers did not spend a second night on the streets. However, he stressed the issue was still a cause for concern.